The choice of baits is not an easy task. Only with a large set of catching baits, you can count on success. Speaking about baits, connoisseurs of bass fishing agree that this fish is not very legible. Angler just has to follow elementary, which knows even the beginner, the rules. And if this does not help, act by intuition, remembering that the fish is unpredictable. We bring to your attention a small review of effective baits for bass, which, judging by the ratings and reviews of anglers, are among the best for catching a bass. Read more information about every type of the bait and choose the right one from all of the bass lures. Here is one of the biggest and great quality fishing lure kit on the market. 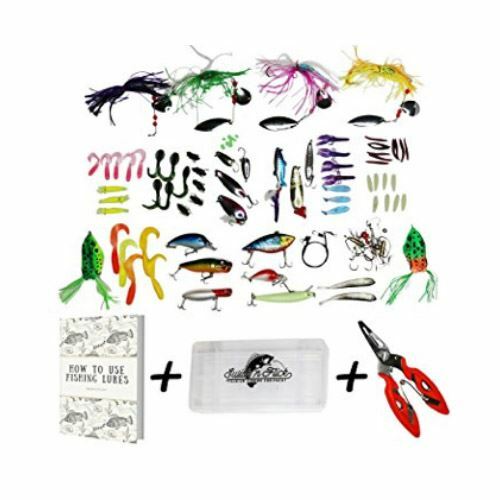 The kit includes more than 17 several of hard and soft fishing lures, extra pair of fishing pliers and a guide book on how to use all of the lures that suit any fishing situation. You can use these lures for freshwater, saltwater, ice fishing or offshore. The kit includes spinnerbaits, frog lures, bread lures, hammers, switches, hooks, earthworm, different spoons and many other. Free guide book explains how to use each lure. The kit comes in durable plastic organizer with pliers. The kit is so big that some of the baits can be out of use. The Original BiCO Jig was designed and made more than twenty years ago. It’s the original jig the founder designed and now it is the leader among all jigs of the BiCO Performance Jigs brand. That’s why it was named “The Original”. The jig features strength, durability, and secure hooksets. The jig has a deep-throat wide gap which features a claw-shaped configuration. The unique hook design is aligned with the eyelet of the jighead to allow for a stiffer, more elongated weedguard without compromising hooksets. The sharp-angle bend keeps trailers from sliding down the hook’s shank. Plastics will stay in place naturally, and last longer with minimal tearing. The jig features a flattened head, which offers particular benefits. The heads are made lead-free in order to increase size without adding extra weight. In addition, the BiCO’s flathead design allows jig-and-trailer presentations to stand upright when in contact with the bottom. Being built for versatility, it performs equally well as a swim jig. The heads are painted with a very durable, high-gloss finish that will not peel off. It requires certain knowledge to use the jig right in order to catch a fish. These bass lures have durable ABS construction and feature reusable and environment protective bait. There is multi-jointed two section body and quick diving lip design to make the bait flexible, provide simulation fish tail. Bright colorful patterns of actual bait fish attract fishes. There is built in gravity ball that helps to raise the throw distance and make some noise to attract the fishes. It is rigged with 2 sharp treble hooks. With the use of this lure you can catch predator fishes such as bass, yellow perch, walleye, pike, muskie, carp,roach, trout, etc. Customers claim the tail doesn’t move properly. Fishing lures are made from hard plastic and have 3 treble hooks .They are very durable thanks to aerodynamic shape you can cast them a mile. 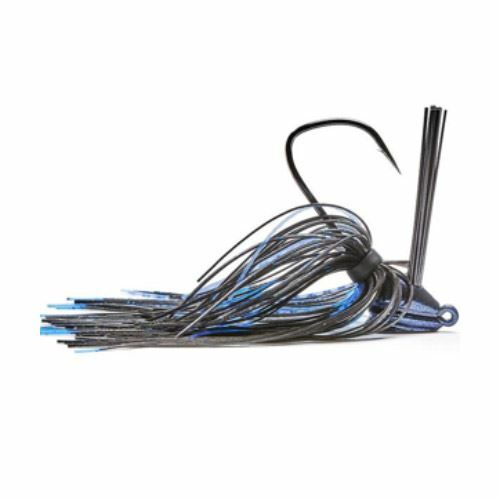 Jerkbaits are one of the few bass lures that are highly effective to use all year long. It is a great fishing lure for battling cold water, even in extremely cold water. Thanks to noise rattle model design which has unique rhythmic sound it’s easier for fish to attack. With steel weighted ball inside, the ball is always rolling when dumping which can control the center easily and can be casted far. With built-in steel ball, can transfer the gravity to the tail when throwing in order to raise the throw distance. It helps to make a steady and smooth air posture without spin. When throw in water, drag it and it can make some noise to attract the fishes. The lure is great for long-casting and troll. Lure provides loud rattles, runs straight. It features premium VMC nickel hooks and 3 superior finish styles. Not all of the hooks are firmly attached to the plastic construction. In case the fish doesn’t bite and you don’t know how to change the situation you should choose Fiona Finesse Worm. This worm lure was tested not once. The softbait go through multiple color changes attracting fish to strike. The color is activated by water temperature, and it changes when submerged. The pattern is changed from a light color to a dark color when moving through fluctuating water temperatures. This worm bass lure is made in USA with the materials that feature a softness and flexibility that fish can’t resist. These baits are suitable for use in both freshwater and saltwater fishing. This bait is long and lean. Some customers receive the product of a bad quality that simply looks old. Thanks to 3D scanning and modeling manufacturer made this perfect lure in appearance and action. 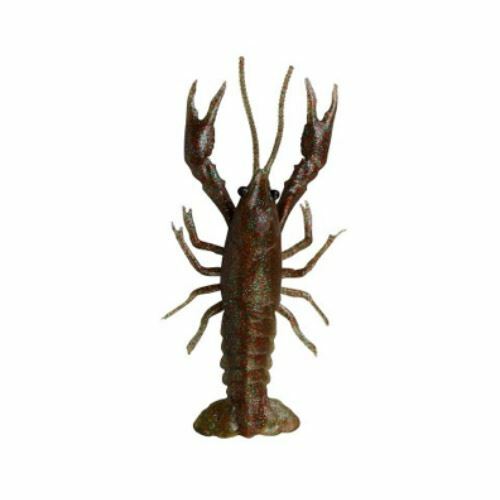 Using a real Crayfish and studying it, Savage Gear succeeded in creating a Crayfish lure that looks and swims as real. 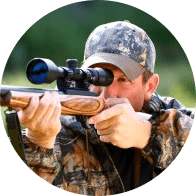 Multiple rigging accessories, offered for perfect use targeting different species, techniques and venues! Air filled claws are made not only for natural underwater movement when the crawfish is rigged forward, but also for defensive. It makes micro movements, even at the tiniest movement and water current. The Air filled head cavity makes the crawfish float so it can be fished on a weighted weedless hook over heavy mats and lily pads. Two legs face forward and two backwards for action on either a forward drag or tail first retrieve. Some customers said it doesn’t look like real Crayfish. You may need another new lure after 2-3 bites. This lure looks and swims like a real fish and it moves completely silent. The parts of the body are connect with textile fabrics, so it moves flexible, simulates fish tail shows. A real swim action makes it a target for hungry fish. The fishing lure is suitable for saltwater fishing and freshwater fishing. It is a reusable swimbait that saves your money and space. There are 2 super sharp rust-proof hooks that are stable and durable. Double connection design is sturdy enough for big fish. The built-in steel ball can transfer the gravity to the tail when throwing in order to raise the throw distance. And it helps to make a steady and smooth air posture without spin. When you throw lure in water, drag it and it can make some noise to attract the fishes. It doesn’t sink deep enough. Silicone and plastic baits for bass firmly entered the set of fisherman. Since the invention of this material, before it came to catching predatory fish, very little time has passed. And now the market of fishing supplies please the eye with an incredible variety of artificial baits of different figurines with hooks. How to choose such lure for fishing this bass, let’s find out. Materials from which plastic baits are made are various. The main thing to know is that a lot of plastic baits are slowly drowning during wiring, and therefore have poor buoyancy. But such baits have their advantages. They are visible in those cases where the jig-head has a light weight, while the lure does not sink, but then slowly sinks into the pond. Choosing the lure depends on the season, water temperature and water you are going to fish. In winter when the temperature is 30-40 for fishing in clear water is better to choose jigs or jigging spoons, for muddy water – crabkbaits and jigs. Temperature of 40-50 and clear water requires jerkbaits, finesse jerkbaits; muddy water – spinnerbaits, vibrating jigs. In spring when the temperature ranges 60-70 for clear water choose jerkbaits, craws, jigs, crankbaits; for muddy water – crankbaits, spinnerbaits, buzzbaits. For a hot summer, when temperature is 70-80+ for clear water are better frogs, diving crankbaits, swimbaits, flipping jigs. In fall anglers tend often to use jigs, offshore worms, shallow crankbaits, jigging spoons and jerkbaits. To choose the right bass lure you should know each type of the lure and its construction. However the choice of it also depends on the color. Imitating natural forage object bait is perceived by the bass naturally and does not cause alertness, and accordingly, the attack will be more confident. The use of baits simulating a natural forage predator gives good results when catching in the upper and middle layers of water with sufficient light and transparency of it. 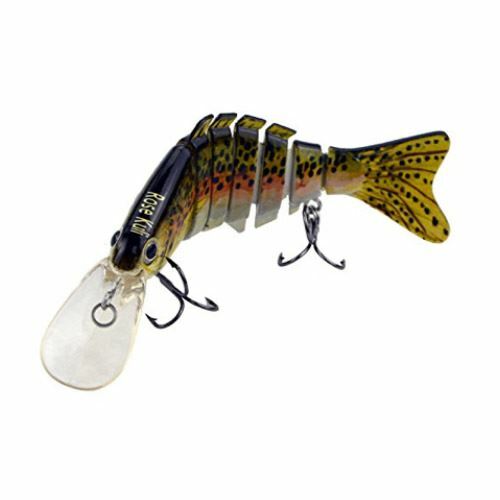 Baits of acid colors are very popular. Most likely, when attacking such baits bass is driven by curiosity, the desire to explore a new object for him. Baits with the contrast colors are those that sharply stand out against the background of the bottom, vegetation, etc. The colors of such baits can be very diverse. 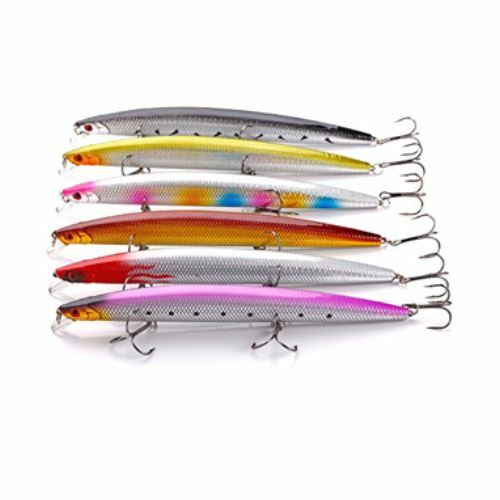 Against the background of the bluish sky, dark lures are contrasted, on the background of the dark sky – light lures with orange or red tones are better. On a light sandy bottom bait colored in bluish tones is well distinguished. In muddy water and with low illumination, for example, in twilight hours and at great depths, the role of bait coloring decreases. 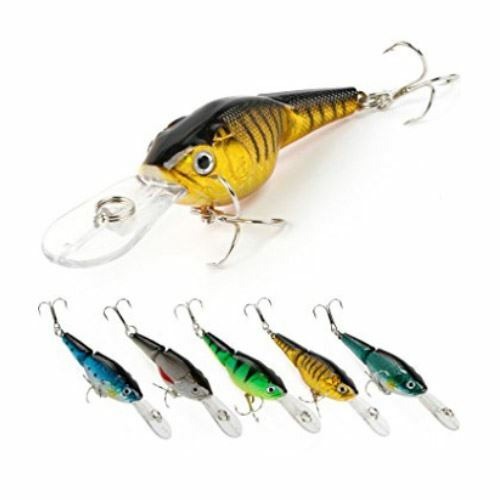 It’s very common that the lures look alike and even have the same features but the price significantly differs. It simply can be explained by marketing of some brands and their popularity, so for example, a crankbait by super famous fishing brand will always be more expensive than a crankbait by some small fishing company, even if it produces really qualitative product. There are days when bass simply doesn’t want to eat any of your bait, so purchasing extremely expensive lure doesn’t give you a guarantee of successful fishing, especially if you are a beginner and don’t know all the secrets & techniques. Spinnerbait is considered to be the most versatile lure to catch big largemouth bass. They are quiet and that is why such lure particularly appeal largemouth bass. Spinnerbait helps to catch largemouth bass in shallow water. 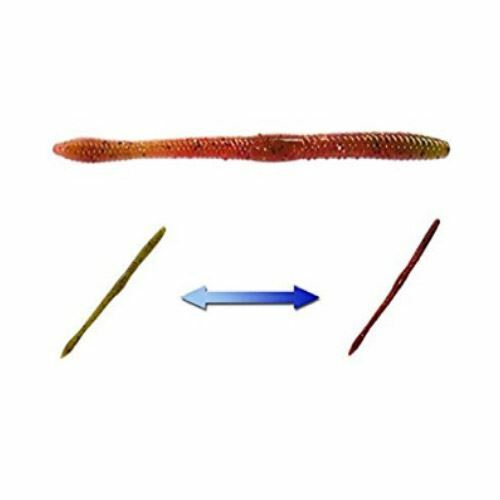 Plastic soft worm also can enhance to catch a big largemouth bass. However, using it is not great idea when bass becomes active. In this case the best choice will be crankbait, especially in winter time fishing. Jigs are very popular and probably the best lure for smallmouth bass. Jig can be used all year long to catch it, what is definitely a great plus. Jigs are considered as big bass producers, so to land a smallmouth bass is more possible. Crankbait is commonly used smallmouth lure when it is active. It’s a great choice when you fishing in a deeper water. It is also great if you are fishing a grassy bottom. When smallmouth is aggressive towards the food it’s time to use topwater lure. Topwater lures are better to use for smallmouth bass is early in the morning or late in the afternoon. When choosing a bait, be sure to focus on the type of predator you are going to catch, season and seasonal features, temperature and transparency of the water. For catching a bass it is better to choose lures of small sizes: compact wobblers and twisters. There is great range of hard and soft lures. Nowadays, silicone baits are in a great demand. These are soft and mobile imitations of fish and other underwater inhabitants (worms, crayfish, larvae), which may also include flavors. No matter what type of lure you choose, remember it is not a certain guarantee to catch a fish if you don’t use special techniques and do not consider all the necessary details for catching bass.